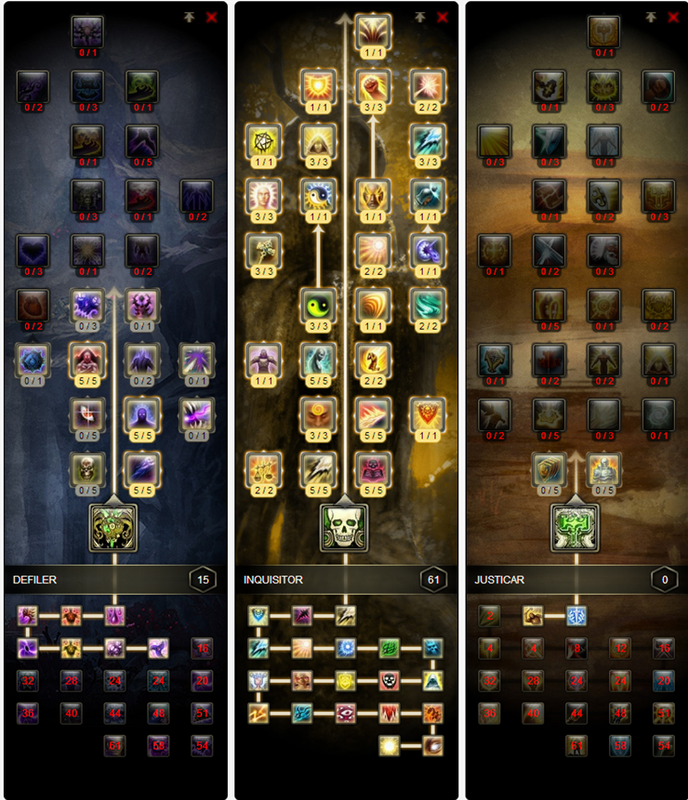 There are 3 different variants of this build, a standard one which pulls the most DPS, one if your going to be below 90% quite often which pulls slightly lower dps and one more for those without Storm Legion souls which pulls the lowest dps of the three builds. This is currently the highest damaging version of the 61 Inquisitor build. The problem with this build is that to get a higher output than the other variant, your health needs to be above 90% at least 80% of the time. This build also has the pros of having a dispel and additional self healing from Justicar on every attack. This makes it quite a strong and sturdy build for solo gameplay and soloing old content. 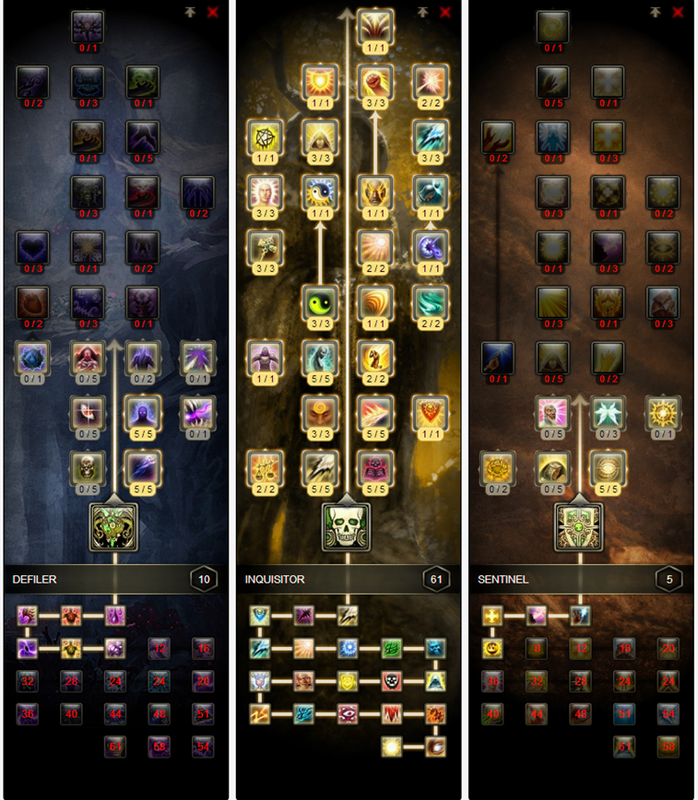 However, if you’re going to solo old content (raids for example), it is likely your health will be below 90% the majority of the time, so if you are using this build purely for soloing you can also move 5 points from Defiler to Justicar for an alternate 10% increased Wisdom and increased endurance and mitigation through passives. This is the alternate build that you should use on fights with a lot of raid damage going out where at least 80% of the time your health is below 90%. The build opts out the 5 points in Defiler that provide a 10% damage increase when you’re over 90% for 5 points in Sentinel, which give you 10% increased Spellpower, despite not having a passive %bonus damage from placing points in the Sentinel tree, this build always seem to rear ahead in comparison to the 10% increase Wisdom. Bear in mind you lose both the dispel and the self-healing from Justicar with this build. You do however gain healing breath, which has it’s occasional use. 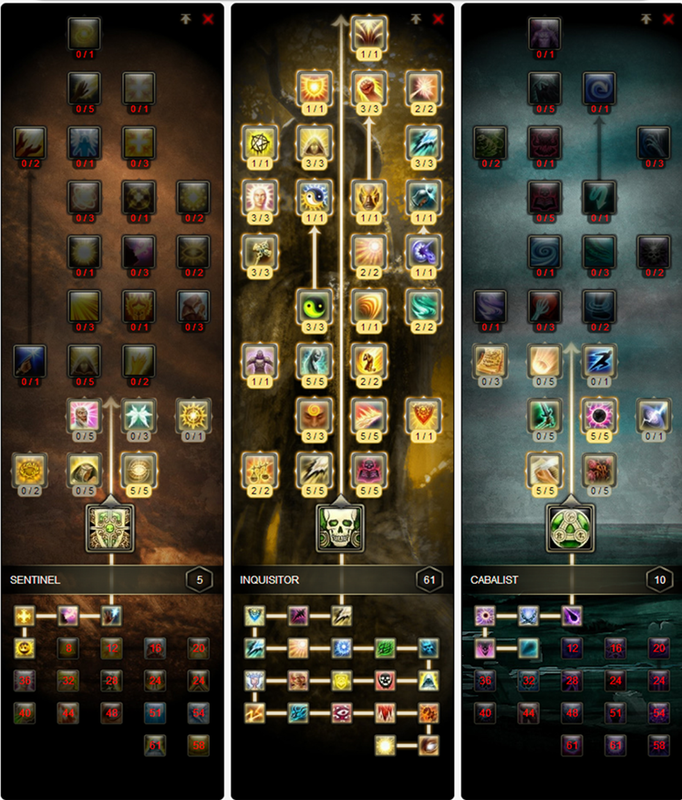 If you do not have access to the Storm Legion souls, this is the best Inquisitor DPS build for you. Not having Defiler means that you’re losing out on both Rage Blight and Blighted Greed, which provide a 5% damage bonus. You will also not have the self-heal utility spell Loathsome Restoration or Marrow harvest for when you are facing away from a target. You do however get healing breath, which has it’s occasional uses as a mediocre burst heal. You’ll also get several abilities from Cabalist, however they are all fairly useless unfortunately. You will notice your Soul Drain has a 10 second cooldown while Circle of Oblivion only has a 7 second channeled duration. This means there is a 1-2 second gap between using another Soul Drain after you’ve cast Circle of Oblivion. Use this time to quickly tab through and put a Scourge on the mobs with the highest health and then rinse and repeat the rotation. Why no Dark Water spec? The Dark Water variant of 61 Inqui spec relies on keeping up and maintaining 3 stacks of Dark Water and is only a very minor dps increase (500-700). This is provided you never let the stacks drop and refresh dark water within the 1-3s of it falling off. If the stacks drop off however or you are playing the build to safe and refreshing the stacks to often, your going to continually lose DPS. Due to the travel time of Dark Water a lot of new players to 61 Inquisitor struggle to keep Dark Water up or continually refresh it far to early, thus resulting in a fairly sizable DPS loss. This is why I often discourage the use of it for new players to 61 Inquisitor. Now realistically for most of the raiding fights in Storm Legion you are not going to have the opportunity to do this, let’s just use Frozen Tempest and Endless Eclipse as an example of why you won’t be able to keep stacks up or if you do it will result in either a dps loss or a danger to the raid. Gelidra: Add Phase, target switching, you will either let the stacks drop off or waste time and GCD’s trying to keep them up on a 99% damage immune Gelidra. Twins: May be worthwhile provided your dps is perfectly balance, if however one is ahead, which is often the case, your either going to risk pushing one to far or loose your stacks target switching. Crucia: Tons of short bursty add phases, need I say more? Matriach: If you can manage to keep the stacks up on Matriach while you are also burning the child, Ahov’s spec may be better! Thanks for reading the guide, if you have any corrections, questions or feedback, please leave them in the comments section below! Ah. I foresee a lot of complaints about the absence of the actual top build. Seatin’s not the best source of build strats; best to consult your local Rift Forums! My philosophy is to make straight forward and effective guides and specs, so players can get to grips with specs easily. When I’m writing guides the player I have in mind is the bad nooby level player in my expert dungeon group. I want to try and persuade him to be better and give him the easiest way to do this. An overwhelming amount of players can’t get to grips with the Dark Water spec and when they are using it do significantly worse DPS. I give people the tools the learn the basics of a build and if they want to go min-max and complicate it further to get slightly more damage output, by all means do so! I’ll always provide a link to those guides. TL;DR My guides serve the purpose of teaching people core rotations in the easiest way possible so they can build up from there if they wish.